When French philosopher Paul Ricoeur died in 2005, he bequeathed to the world a highly regarded, widely influential body of work which established him as one of the greatest thinkers of our time. He also left behind a number of unfinished projects that are gathered here and translated into English for the first time. Living Up to Death consists of one major essay and nine fragments. Composed in 1996, the essay is the kernel of an unrealized book on the subject of mortality. Likely inspired by his wife’s approaching death, it examines not one’s own passing but one’s experience of others dying. Ricoeur notes that when thinking about death the imagination is paramount, since we cannot truly experience our own passing. But those we leave behind do, and Ricoeur posits that the idea of life after death originated in the awareness of our own end posthumously resonating with our survivors. The fragments in this volume were written over the course of the last few months of Ricoeur’s life as his health failed, and they represent his very last work. They cover a range of topics, touching on biblical scholarship, the philosophy of language, and the idea of selfhood he first addressed in Oneself as Another. And while they contain numerous philosophical insights, these fragments are perhaps most significant for providing an invaluable look at Ricoeur’s mind at work. 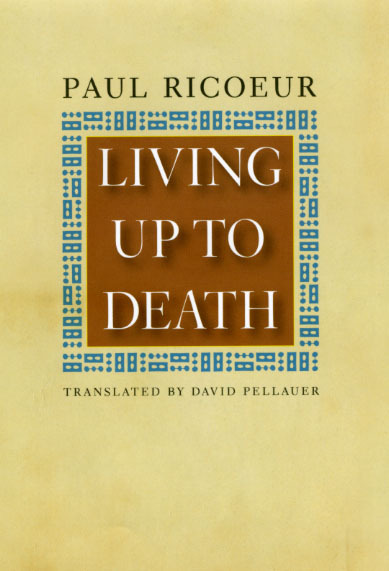 As poignant as it is perceptive, Living Up to Death is a moving testimony to Ricoeur’s willingness to confront his own mortality with serious questions, a touching insouciance, and hope for the future. "This book is an excellent translation . . . and will be interesting and even fascinating to scholars who are already familiar with Ricoeur’s work." "These are pages written, not while gazing into an abyss, but while being swallowed up by it." "This last work by Ricoeur, published posthumously, does justice to the stature he gained in his lifetime as a leading 21st century philosopher."